Larry “Abe” Eugene Brummette, 73, of Heiskell, died Tuesday, November 6, 2018 at the Methodist Medical Center. He was born April 9, 1945 in Knoxville, TN, the son of Joseph Owen Brummette Sr., and Margaret Louise McKinney Brummette. Mr. Brummette served with the Air National Guard. 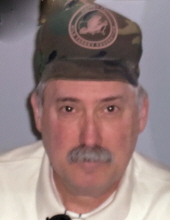 He was a member of the Pipefitters Union and enjoyed fishing, hunting, and gun reloading. He was a fan of the Knoxville Ice Bears. He is survived by 3-stepdaughters, Shari Kamel and husband Cyrus of Knoxville, Stephanie Norwood of Oak Ridge and Jennifer Kanipes and husband Jason of Clinton; brother, Joseph Owen Brummette Jr. and Connie Minks of Lexington, KY; sister, Carol Carroll and husband Ace of Knoxville; and grandchildren, Stephen Norwood, Micha Kamel, Kalie Kamel, Bailey Walker, Teneia Harris and Jaxsen Kanipes. The family will receive friends on Thursday, November 29, 2018 from 6 – 8pm at Weatherford Mortuary. An on-line guest book can be signed at www.weatherfordmortuary.com. To send flowers or a remembrance gift to the family of Larry Eugene Brummette, please visit our Tribute Store. "Email Address" would like to share the life celebration of Larry Eugene Brummette. Click on the "link" to go to share a favorite memory or leave a condolence message for the family.